Great Smoky Mountains National Park is famous for its changing leaf colors during fall. Here are some of our favorite places in the area to view the stunning color displays. The color season lasts about 6-7 weeks, from mid-September through October and into early November, with leaves turning first at the mountain tops and working their way down slope over the weeks. You can experience fall colors in different ways and at different times in the season along the park’s numerous hikes, viewpoints, and scenic drives. Newfound Gap Overlook is 15.5 miles along this road from Gatlinburg, and provides dramatic views of both states.This is one of the most popular scenic overlooks in the park. Carlos Campbell Overlook is reached early in the drive, 2-3 miles out from Gatlinburg. It offers great views including maybe the best view of Mt LeConte. Inspiration Point on the Alum Cave Trail is a hike if you’re up for it. Alum Cave Trail is a good way to experience the colors offered by old growth forest. Inspiration Point, located 1.8 miles along the trail, is a popular destination for day hikers, with superb views. Clingmans Dome road turns off Hwy 441 just past Newfound Gap Overlook. Clingmans Dome is actually the mountain, while its famous Observation Tower offers stunning views of up to seven states. The tower is closed for upgrades all winter, but the road is open and the parking lot offers spectacular views of the mountains. There are also several hiking trails of varying difficulty nearby. See our guide to Clingmans Dome. Wears Valley is the way out west from Gatlinburg and Pigeon Forge. Known as the “Quiet Side” of the Smoky Mountains, this area offers spectacular vistas of the mountains and enormously scenic drives and hikes. Wears Valley Road is one of the two ways that visitors most frequently use to get to Cades Cove – the most popular place in the national park, and beautiful all year around. See our guide to Wears Valley and also our guide to Cades Cove. Wears Valley Road, also known as Highway 321, is a scenic drive in its own right, and rests at a lower elevation than most of the park. The middle to lower elevations are where the full lavish displays of color take place, and from Gatlinburg all through Wears Valley as the peak color happens you are immersed in color, which you can enjoy here even late in the season. Nearby also is the Foothills Parkway, which offers numerous vistas and viewpoints for photography. You don’t have to be a serious hiker to get out in nature in the park. There are many short and easy walks and trails you can take, as well as opportunities to appreciate the season from the comfort of your car. Walking If you’re looking to avoid crowds and quietly immerse back into nature, look for the Quiet Walkways in the national park – see our guide to Quiet Walkways of the Park. Most of these trails are between 1/4 and 1/2 mile long, and take you off the highway and straight into a rewarding forest experience. Also see our guide to Easy Walks in the Smoky Mountains. This offers a range of walking opportunities in the park and the surrounding area for people of all ages, interests, and capabilities. Driving Scenic drives abound, and Roaring Fork Motor Nature Trail is unique as a nature trail that the park service has turned into a one-way loop that you can drive. You could spend all day on it, with numerous pull-offs and even trailheads along a way that leads you through valleys, over mountaintops, and alongside roaring creeks. This mid-elevation motor trail offers the most intense colors during the heart of the fall season. There are several overlooks along the way, including Piney Mountain at 3000 feet. The national park covers half a million acres, while the surrounding area offers multiple scenic attractions as well. See our guide to The Top 10 Ways to Enjoy the Fall Colors in the Smoky Mountains for some ideas you may not have thought of to enjoy the fall colors if you’re in the area. And don’t forget the chair lifts and the coasters of the area. Many of the attractions in Gatlinburg and Pigeon Forge offer excellent scenic vistas, because in truth the mountains and the colors of more than 100 species of tree are all around, wherever you are. Many people will agree that one of the coolest ways to watch the leaves turn in the Smoky Mountains is from your own back deck, and in the hot tub for ultimate luxury. We have many cabins with stunning views of the mountains, and many also in park-like settings, deep in the trees. Either way, hanging out at the cabin is one of the great activities in the Smokies. Call us at 855-91-SMOKY anytime for more information and cabins and cabin deals. Check out our Gatlinburg cabin rentals and our Pigeon Forge cabins. And don’t overlook our Wears Valley cabins, on the quiet side of the Smokies, close to Cades Cove and with fabulous mountain views, and colorful scenic drives all around you. 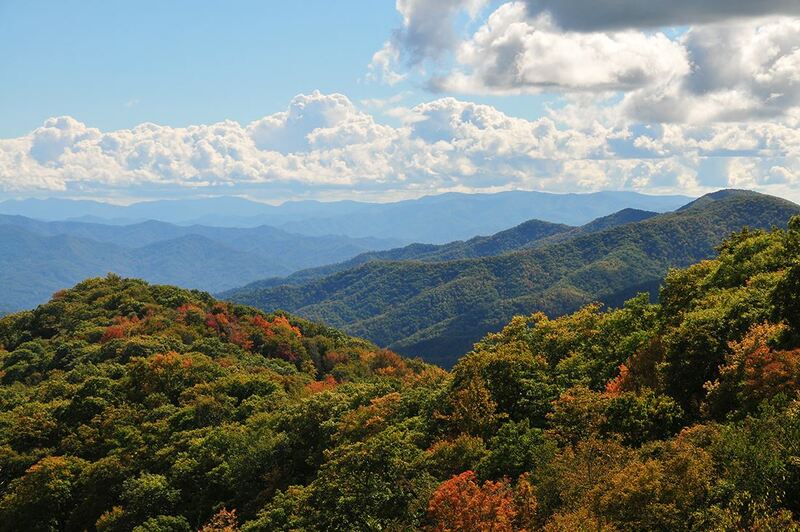 The Top 10 Ways to Enjoy the Fall Colors in the Smoky Mountains Happening Right Now!